In 1998, I had the privilege of accompanying the playwright Brian McAvera on a tour around the Artranspennine exhibition. He had been commissioned to review this event for the magazines Artists Newsletter and Sculpture (USA). For ATP08, with Brian’s permission, this text is republished for consideration 10 years after the initial event, together with some previously unpublished photographs. This experience was eye-opening for me as I became acutely aware of just how much work was involved in a thorough investigation and evaluation. 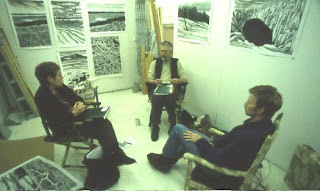 There were many meetings along the way, some in home in Liverpool, and in my studio in Manchester; others in cafes and bars, and on site. I was able to observe and occasionally contribute to an incredibly intense series of debates. Some artists and organisations were enthusiastic to engage with us; others were keen to have their pre-prepared dialogue included in any review (this rarely happened). Many who were more critical wanted to maintain anonymity as they often worked for or with the organisations involved, and quite reasonably did not want their views to be seen as representative of their ‘employers’. I was amazed to see how many doors could be opened for an art critic! At one point we were offered a 4 wheel drive Landrover and a guide to ‘tour’ a particular site when a member of staff realised the purpose of the visit. I doubt if I have been offered so much ‘hospitality’ over a period of six days, prior to or since. Being unofficial organiser, driver and photographer for Brian McAvera, my name appeared in both published texts and I had accreditation for the images. For some time afterwards, although my contribution was tiny, I was either congratulated or berated by readers of these articles. Both praised and damned by association… ATP98 was a journey of discovery. Life has moved rapidly for Brian McAvera in the post-Artranspennine period. His cycle of plays Picasso’s Women, after having been performed at the National Theatre, London and the Edinburgh Festival, are now translated into eleven languages and have been performed around the world. Other plays performed at the Edinburgh Festival since then are Yo! Picasso! And Kings of the Road, all of which have been published by Oberon Books, London . 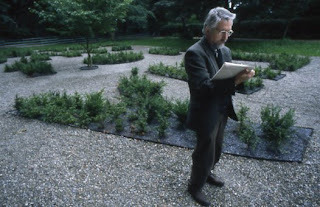 'Making an art exhibition is not simply a matter of practicality, but of necessity and morality'. Robert Hopper. 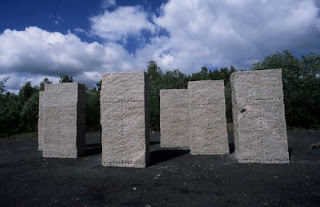 Co-curator, in artranspennine98, The Henry Moore Foundation Review, No 6, 1998.
artranspennine98 is variously referred to as 'a project', 'a fully curated exhibition', 'a true manifestation of public art', 'an international contemporary art exhibition', 'the largest contemporary art exhibition this country has ever seen', 'a new kind of exhibition', and even 'a dialogue between art, people and place'. Most of these descriptions, all of which are taken from the official literature or from curatorial statements, seem to me to be in the realm of Alice in Wonderland, where words mean whatever the Red Queen wants them to mean, at any given time. The variousness of the descriptions, as well the scale of the project - roughly fifty artists, forty projects, and thirty sites (though the figures vary according to which piece of official literature you read) - indicate the nature of the problem : the 'exhibition' is 'all things to all men'; a mismash of different art practices, straddling disparate geographical areas, and so diffuse as to be almost impossible to write about with any degree of coherence. As I journeyed around the world of artranspennine98, it became clear that the 'exhibition' had received, and was still receiving, a bad press (I asked officially for copies of reviews and articles so that I could report back accurately on this matter, but they never arrived. Art Review's 'talentless trash' is fairly representative of the coverage that I have seen). In practice, after a week's intensive travelling, viewing, and discussion, I realised that the 'exhibition' organisers were like Sisyphus, eternally rolling their enormous stone to the top of a mountain, only to have it promptly roll back down again. In place of ideological or artistic coherence, they supplied a rhetorical coherence which enmeshed the visible manifestations - the artworks - in a fantasy created by the curators. For the viewer, Sisyphus also came to mind. On one particular day, with the benefit of a coach and driver from the Henry Moore Foundation, it took seven hours to cover four projects. The driver remarked on the inadequacy of the signage. The rest of us remarked on how much it would cost an individual, in terms of time, money, travelling expenses, B & B accomodation and sustenance, to see even a small percentage of the work. We played a game while travelling around : spot the signage. We usually didn't. I'm told there are four signage elements to the Ruckheim for example. We spent an hour travelling around the area which leads to its Outwood Colliery site (which tells you something about the travel information provided in the guides). We found one sign : at the entrance to the colliery. Signage, as in information boards, was made to a uniform size and was frequently intrusive, and too large. Various artists complained that it was often inaccurate as well, and had to be sent back. (e.g. River Medlock Bridge project, Oxford Road, Manchester. When I saw this artwork, only a month before the exhibition closed, there was still no signage). According to the press office, everything was done in consultation with the artist. According to the artists I talked to, there was little consultation. So who is the 'exhibition' for? Very few people will do what I did, which is to spend an intensive week travelling around the various sites - and I had the benefit of two organised coach tours, plus Geoff Molyneux, an artist friend, familiar with the region, who drove me around and helped me make contact with artists and organisations. If the point is that tourists would discover the region through the art, then all I can say is that few tourists, other than those who would already have been there, would ever discover that these events were happening. The only places where I ever found information about artstranpennine98 were galleries or museums. Why not produce leaflets for all tourist offices in which all the sites are listed? The exhibition guide is not helpful in terms of guiding one around the diverse nature of the sites. Maps for out-of-city sites would have been sensible. The 'information hubs' are mainly in art galleries or institutes. Therefore the only likely people to see the work are people who go to art galleries. They aren't especially useful anyway. The Tate in Liverpool for example, did not have information on the 3 Month Gallery and Benefit Agencies' artworks. It took us three days to find one leaflet in Liverpool. If the work was for the people in the area, then the concept has clearly failed, to judge by local reactions. Even people in non-art establishments like the restaurant Mash & Air in Manchester knew next to nothing about the project. At one point we were directed to another exhibition in the building. In the Museum of Science and Industry, the staff couldn't even direct us to where the exhibition was taking place. The Gladstone Hotel in Liverpool where Tea had a video project, had the signage behind a potted plant and the video switched off (though the staff were very accomodating when help was requested). Unless you had unlimited time and an unlimited budget, this overall project stays firmly in the realm of an exhibition-in-the-mind. As a C.D. Rom linked to a virtual reality console, it might have worked. And if the point was that you were meant to dip in and out of the project, then how can you claim an 'overall coherence' for it? This was supposed to be an 'exhibition' about getting new audiences, about establishing a dialogue with a public which is traditionally sceptical about contemporary art. In the broadest sense, it was, in theory, about educating the public. In galleries such as the Tate, schoolkids and art students are regularly taken around the work. 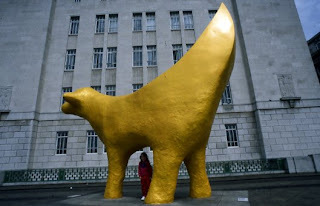 What is one to make of the statements appended to the maquette for Chiezo's Super Lamb Banana which claim that this work is 'new and shocking', not to mention 'a valuable artistic asset to Liverpool'. This is language borrowed from the world of advertising. It has nothing to do with art. It does not tell the truth in any shape or form. New? Shocking? An artistic asset? Do the writers of this kind of garbage wish to distort educational development? Are they simply cynical? Do the curators believe in this kind of dishonesty? The work, better suited to a kid's theme park, is pure kitsch. No one that I talked to, whether artist, administrator, curator or member of the public had a good word to say for it. More importantly, the written context within which this work was placed, signally failed to argue its case. There is no such thing as the transpennine region. The hills cut the region in two. People do not see themselves as part of a 'transpennine' culture or identity, and this is reflected historically in terms of literature, and travel-writing. As far as I know no sociologist, anthropologist or historical geographer has made a case for the transpennine region. Certainly, the curators carefully avoid any attempt to make a substantive case for the 'region'. It's a fiction, in the same way that Trollope or Hardy created regional fictions. According to the curators, this 'exhibition' will allow an 'awakening of identity' and establish the 'region' as 'a place undivided by history'. But how can you reveal an identity if there isn't one there in the first place? How can you remove the continuing legacies of history, and tradition, not to mention geography, and so be 'undivided by history'.This is unreal, irrelevant, and deeply insensitive to regional realities. It's the stuff of Fantasy Island. According to the curators, projects 'should be rooted in some aspect of [the artstranpennine] region'. If we ignore the lunacy of revealing a non-existing region for a moment, and generously assume that what they mean is that any given artist must reveal an aspect of the immediate area within which he or she is working, then the blunt response has to be, that the majority of the 'works' in this 'exhibition' signally failed to do so. The Kabakov has nothing to do with Manchester, other than the fact that the artists wanted to have an exhibition in Manchester. The Ruckheim conspicuously ignores the fact that the site was a colliery. According to Robert Hopper, Ruckheim was told that the original workings, including the natural wildnerness already there, would be left intact. The response to this might be as follows : 1) Was the site levelled and replanted without anyone being aware of it? 2) The essential Ruckheim elements bear considerable relation to pre-existing Ruckheims but no obvious relationship to a colliery. 3. Other critical comment suggests that I am not alone in this view. If you want to see a brutally clear demonstration of gallery art versus social, political and cultural context, then look at Mark Dion's tasteless S.O.S. 1998 [shades of the Titanic movie?] in which a half-submerged boat [inaccurately described as a ship] with accompanying flotsam, is placed on the concrete gallery floor. Unfortunately for Dion, the view out of the gallery window into Albert Dock is much more interesting and relevant to social, politcal and cultural considerations than the giganticism and victorian-style spectacle of his artwork. Work like this doesn't engage with anything. It mimics, pumps up elements like a balloon, and like the trailer for Godzilla it informs us that SIZE MATTERS. It doesn't. The unfolding revelation of region may exist in the mind of the curators, but it certainly doesn't exist in the practice of most of their chosen artists. Many of the works in this 'exhibition' pre-existed their showing in artranspennine. The Kabakov for example was developed by Artangel and first shown at the Roundhouse in London. Now I am aware that Kabokov was interested in showing in Manchester several years ago and Robert Hopper told me that Artranspennine were involved in developing the exhibition, but theKabokov catalogue makes no reference to them in the credits. Furthermore, exactly how is Kabokov's work 'rooted in aspects' of the Transpennine region? According to the ideology, this 'exhibition ...is an alternative to the closed circuit of the artworld' yet in practice most of the exhibits are in art galleries and museums. In many of these places one is charged a fee to see the exhibition (in the Tate for example, and in the Science and Technology museum). If the exhibition is supposed to 'go beyond the commodification of art', and to help circumvent the presentation in museums worldwide of a relatively few artists, how come a large number of works in this 'exhibition' are for sale? And how come that the most promoted elements are precisely the usual signature-artist suspects? It seemed to me that if you were already rich and/or famous, you acquired attention. The reverse was not necessarily so. For example, if the curators were seriously interested in working with indigeneous artists, or with communites, or even in steering the public into odd and interesting non-art areas where they might see interesting or unsual art practices, then how come Crystal State, an imaginative and intriguing project in which fifteen artists worked in 12 Benefit Offices, seems to have been so underfunded and so poorly publicised? The individual artists were paid only 180 pounds each (fee and materials). [The gallery and its two curators were given a total of 9000 - which was more than their annual gallery budget for a year. Their official fees were 3500 each. But out of that they had to fund the other others, make the video, organise the exhibition etc. On paper, for lottery funding, 2 'artists' get 3500 each. In practice, 12 artists get paid 180 pounds each, including their costs. You can call this 'finessing', 'being economical with the truth' or at the very least unpleasant manipulation of the truth.] Of course the 9000 allowed the gallery to get work done which otherwise would not have been done. Businessmen put each other in these kind of situations. It would seem that the arts are to be run in this fashion too. By comparison the Ruckheim, according to the local paper the Evening News, cost 400,000. Again I asked officially for details of what various elements had cost, but was told that these details were not available yet. Did no one have budgets? The record of the exhibition in the 3 Month Gallery consisted of a series of photographs so small that even with the aid of a magnifying lens you couldn't figure out what was happening in many of them. The video, which featured artists talking about their work, only dealt with roughly half of the artists. None of their names are listed in the exhibition guide though the curators of the gallery are. When I asked the 3 Month Gallery curators why this was so, the response was that artranspennine had the names of all of the artists but chose to print only theirs. I wonder why..? When I finally found Crystal State's small brochure, the only information consisted of addresses and an outline map of the region - but they had had to print that themselves! According to one of the artists involved, Kate Wise, the Benefits Agency refused to co-operate in any way. This is marginalisation. This is a project which is there for the accountancy books : we used fifteen local artists, didn't we? You will have noticed by now that I keep putting the word 'exhibition' in inverted commas. This is because it's a concept rather than an exhibition. Perhaps it could be considered as a wide range of mini exhibitions, some of which function in normal exhibition terms - as with the top floor of the Tate in Liverpool - and seem independent of the surrounding brouhaha; some of which are local manifestations of specific kinds of art practice, as with TEA or the 3 Month Gallery artists; some of which are opportunistic smash-and-grab raids, as with the Ruckheim (it being the Irwell Sculpture Trail that approached artstranpennine, though the exhibition guide implies the reverse) - I could go on, but you get the picture. I don't wish to downplay the huge practical, financial and administrative efforts that went into the attempted realisation of this conceptual curation, but I think it is legitimate to question the very bases of the project. The Liverpool Tate is on one side of the Pennines, the Henry Moore Institute on the other. So far as I can see, that is the only major 'artranspennine' connection in the concept. We are told that 'if art is to have a collective meaning in a period of social and ideological fragmentation, the art must connect closely with place and with people', yet this concept conspicuously fails to do either. In an astonishing feat of linguistic casuistry we are informed that the concept is a 'true manifestation of public art', then told that there is no 'separate species or genre of art called 'public' ', and then told that the curators wish to bring public art practice 'closer to the word of galleries and museums' though the medium of 'a fully curated exhibition'. If public art doesn't exist, why label the concept as a 'true manifestation' of it? What is a fully curated exhibition? Whatever it is, it isn't this exhibition. Why should public art be brought closer to the world of galleries and museums? The problem with much of it is that it never left these worlds! The only sense in which this concept is an 'exhibition' resides in the fact that most of the work shown is gallery art, complete with price tag, incremental manipulation of reputations [association with major institutions and large-scale finance equals rise in prestige and price of work], and studied aversion to the general public. The most worrying aspect of this kind of huge 'baggy monster' art concept is the rhetoric which is used to sell it. There is a world of artspeak out there (from artranspennine to the Tate to IMMA) in which the rhetoric is increasingly at odds with that which it purports to explain and promote. It's a world of spin-doctoring, a world in which serious argument is no longer addressed, and where any argument that does not toe the status quo is answered by way of evasion, disinformation, or marginalisation of the messenger. Robert Hopper's response to my rather polite comments on what I had seen was a suave commentary of 'facts', followed by him sending me two Romanians who had a 'more positive' response to what they had seen. That's a spin doctor's approach. The publicity machine's approach was evasive (though I would hate to have their job). At one point I asked about the already-mentioned TEA project which connected four hotels in the region. A video was set up in each hotel lobby. I had suggested to the artists that it might have been logical to alert those passing through the hotel to the existence of the artwork, using for example, leaflets placed alongside other hotel literature. They agreed. They had previously asked to do this, but artstranspennine refused to allow them to do it! When I asked artstranpennine why this was so, the response was that every project would then have needed a leaflet. This is patent nonsense. I suggested that by not allowing the leaflet, the organisation was actively interfering in the creation of the artwork. No response. 'Making an art exhibition is not simply a matter of practicality, but of necessity and morality'. I entirely agree. But where is the necessity for this 'exhibition' ? Why have the practicalities been largely ignored? And what is the morality of 400,000 for a Ruckheim project and 180 pounds an artist for the Benefit offices project? Each project, I gather, had a project manager. In the case of Tea, they went through three project managers, the last of whom they only talked to once, and that at their request. When asked if they had regular meetings with the curators, the response was that they had had two discussions, both of them about funding. The 3 Month Gallery had two discussions with curators, primarily about funding before being passed on to administrators. Is this what is meant by 'a fully curated exhibition'? Brian McAvera is a playwright, curator and art critic. In researching this article, he spent 6 full days travelling around the majority of the artstrannpenine projects, and spoke to over seventy artists, curators, administrators, gallery owners, and members of the public.